Generally speaking, I have pretty long days (but don’t we all?). My kryptonite is the half-hour drive home from work. Somewhere around…Southfield, I can barely keep my eyes open and fantasize about crawling straight into bed, without a proper dinner, or any phone calls, and without touching my computer. I can’t think of a time when this actually has happened. Tonight being no different, I ate out of a container of potato salad (that recipe to come — my new favorite) and kind of gave up on making dinner. I knew I should make something out of the refrigerator currently packed with ingredients, but couldn’t bring myself to do it. Finally I gave in to my squeeze’s pleas to allow him to pick up some food for me — and the restaurant was closed. Of course. So, I dragged myself into the kitchen and started pulling things out of the refrigerator. After hosting a baby shower and making a big dinner-sized lunch on Father’s Day, there literally is no room in there. When I came upon the giant container of basil (that I got from Trader Joe’s for $2.99 — a small victory after two dead basil plants so far this year!) I knew there was some sort of basil stir fry out there in the world and I decided to investigate. HERE is the recipe I found. 1. 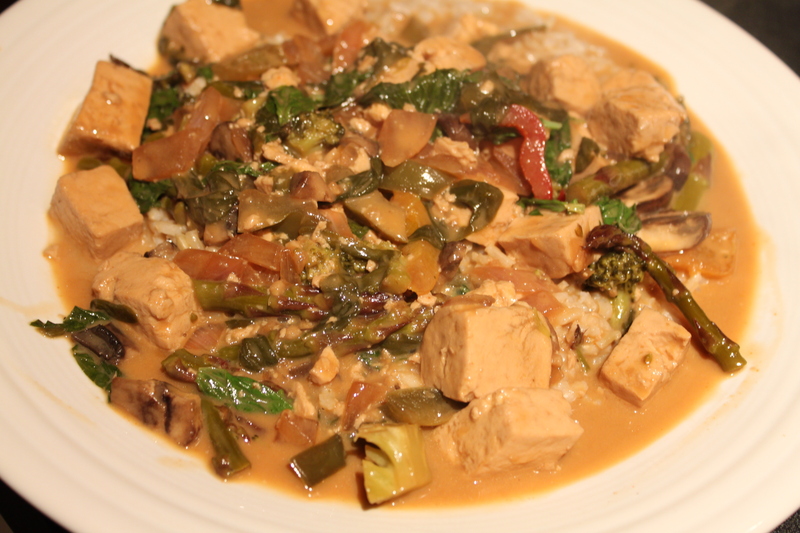 In a bowl, mix coconut milk, vinegar, fish sauce, soy sauce and red pepper. 2. Over medium high heat, cook onion, fresh grated ginger (if you have it — I didn’t so that’s why I used some ginger oil instead of olive oil) and garlic for a few minutes until it starts to brown. 3. 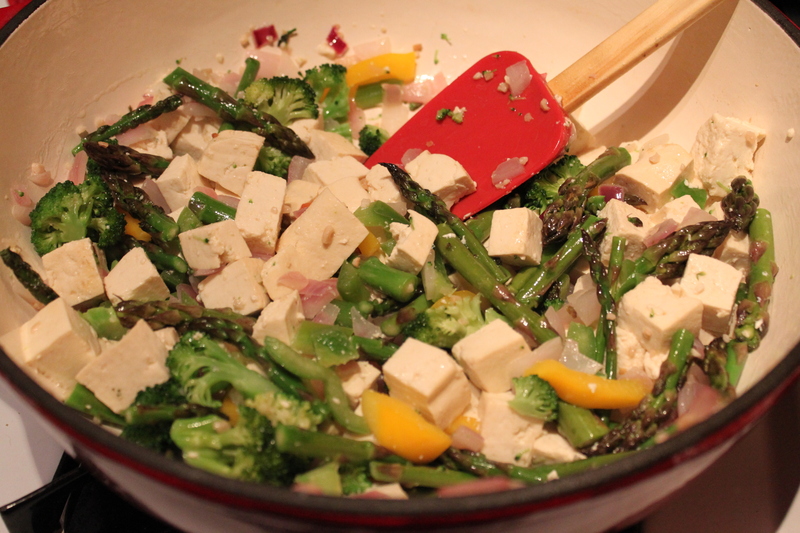 Next I added the tofu and one-by-one added the broccoli, asparagus and peppers. Saute for a few minutes until cooked through. 4. Add sauce and continue cooking until it reduces by 1/3 and thickens up a little. At this point I added the baggie of spinach I had on hand too. 5. When sauce seems reduced enough (The picture to the right shows how much I reduced it), add chopped mushrooms and basil, then cook 1-2 minutes until heated through. 6. I served over brown rice. I’m pretty happy with the results! I am notorious for trying to make D try things I make, sticking food-filled forks in his face, even though I know he only likes to eat during meals. Apparently the delicious smells were too much for him, so he came over to investigate, had a couple of bites and asked me to make it again sometime. So, I’d say it’s a success! 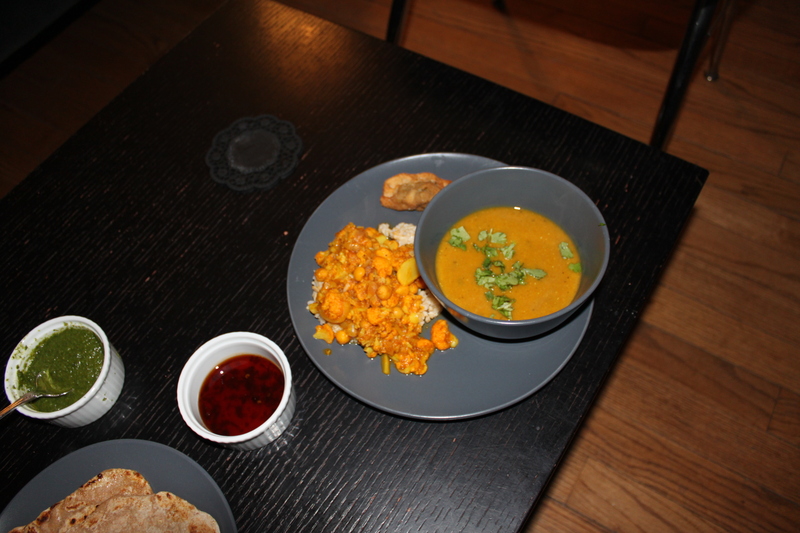 This recipe comes from the lovely Katie E., who created this for our Indian Cooking Club night back in April (I’m way behind with my posts as you can see!) It was DELICIOUS. Simmer for 45 minutes. Don’t let it get to a rolling boil. After 45 minutes, strain the vegetable out of the stock. 1. Soak then lentils for about an hour before making the soup. 2. Remove the core of the tomatos and score the skin. Fill a medium saucepan with 1 inch of water, place the tomatoes inside and bring to a boil. Cook till the skin is falling off. When tomatoes have cooled remove the skin and set aside. 3. Chop the carrots, leeks, shallot and 2 cloves of garlic and saute them in the butter for a few minutes, till soft, with a dash of salt to help draw out the moisture. 4. While that’s cooking, drain the lentils and put in the stock and simmer. Add vegetables and cook till everything is tender, about 30 mins. 5. At this point, you can either transfer it into you food processor in batches or use an immersion blender to puree the soup to your liking. 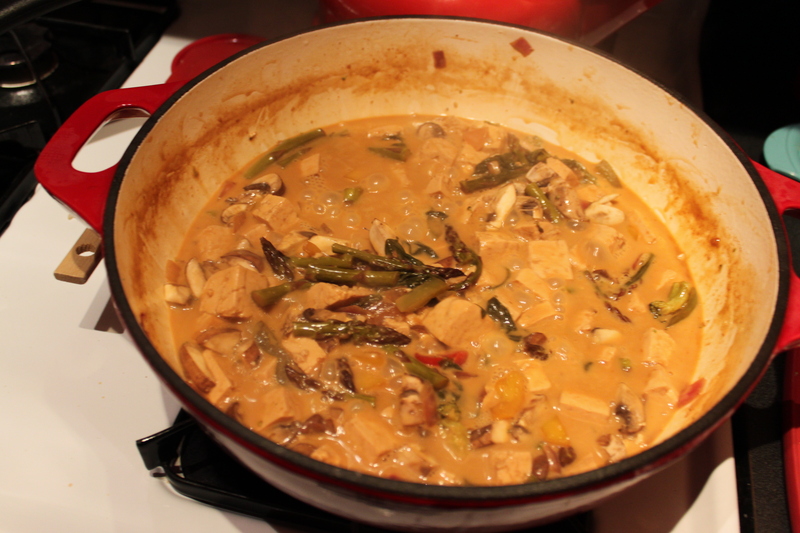 Once, the soup is blended, add the coconut milk and start adding the spices and ginger. Those measurements are based on what I did but I usually start with less and add to taste. 6. At this point I add the rest of the garlic by grating it on a microplane. In the last few minutes of cooking, I muddle the cilantro in a mortar and pestle, yielding about 2 tablespoons, and add it. I threw together a super simple mini cheesecake recipe today for Father’s Day. D loves cheesecake, but if a whole cheesecake is sitting in our house, we’ll eat it and regret it in oh, so many ways. It took about 15 minutes to throw together and baked for about 25 minutes, so it definitely is something I will do again — especially if I’m in a hurry! The original recipe is for 6 cupcake-sized cheesecakes, but I made about 18 mini muffin-sized ones. I ended up baking them for the same amount of time the larger ones called for, so it may take a little longer to cook if you make the bigger ones. I stuck a few fresh blueberries in some and sliced strawberries in some too — very good! The only thing I would do differently is using paper liners instead of just cooking spray — there was just no way to get them out of there without destroying them (thus, no picture — but they still tasted great!). Perhaps if I had let them cool more before trying to remove and devour them, we could have gotten them out in one piece. 1. Mix together and press a small amount into the bottom of each muffin cup. 2. Bake for about 4 minutes at 325 degrees. 1. Mix together ingredients and fill muffin cups (technically should be a little below top line of cup, but I accidentally filled most of mine up and it was fine). 2. Bake approximately 25 minutes, until a toothpick comes out of cheesecake clean. 3. Top with fresh fruit either before or after baking. 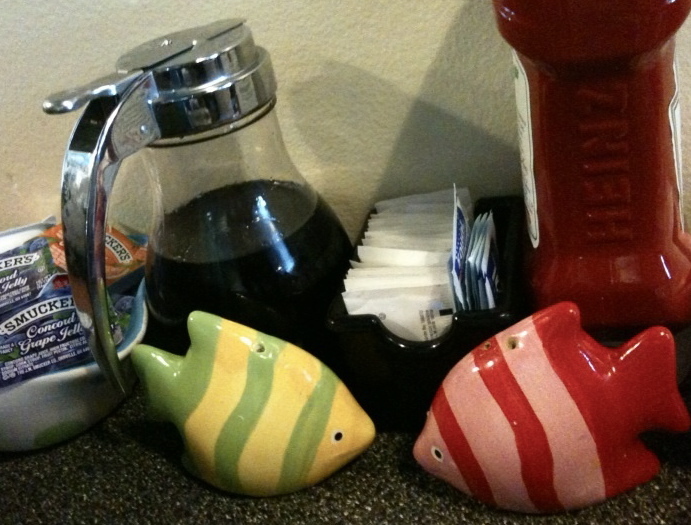 I love going out to breakfast and my squeeze…not so much. But he indulges me from time to time. 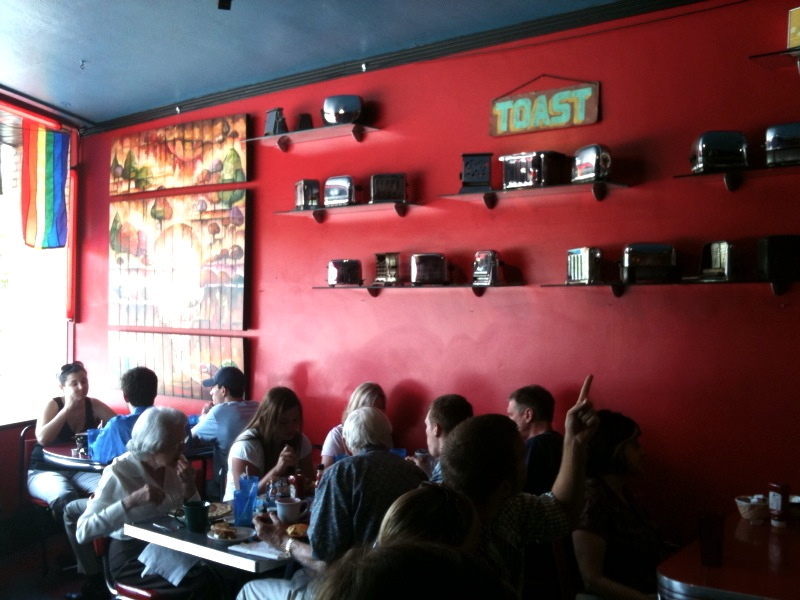 Toast in Ferndale is one of those places I’ve wanted to go to since I moved here. The menu sounded good and I’ve only ever been able to make it there for lunch once with Claire. Since we were up and out the door around 10:30 this morning, we figured there wouldn’t be too long of a wait and we were right. We grabbed a cup of coffee from their help yourself coffee stand and our table was ready. Although I had stepped inside to pay the bill when Claire and i were there last year (we ate outside on their adorable little patio alcove), I never really looked around. 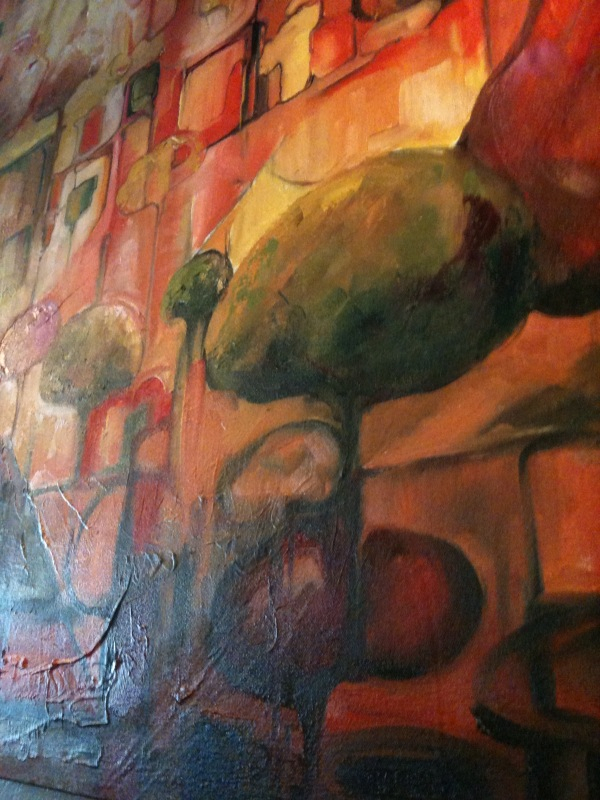 I’m not sure if the art is rotating or permanent, but there are several paintings throughout the restaurant in reds and oranges and greens. 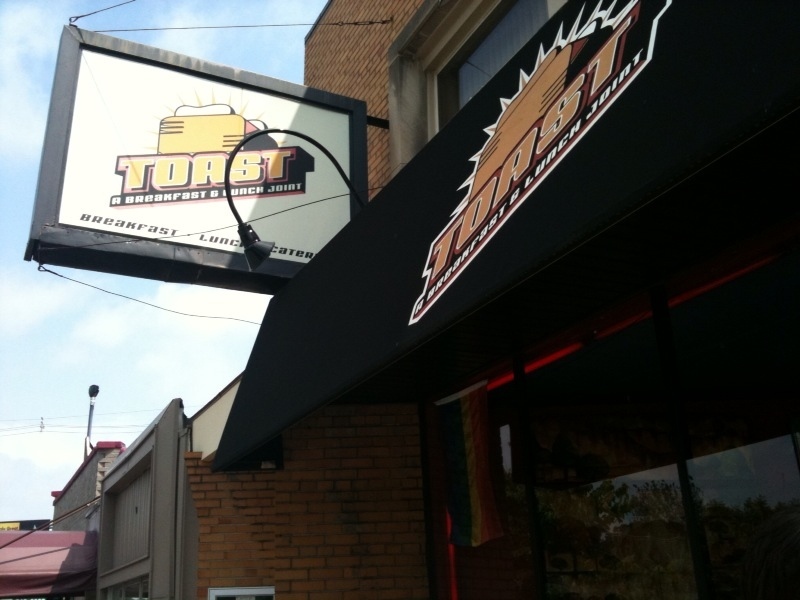 And, of course, true to its name, there are several silver toasters lining the front window along Woodward Avenue and the large red wall at the front of the restaurant. I expected to have to wait a while for breakfast as it was definitely a packed house. But the staff was hustling and we were eating within about 10 minutes of ordering max. The breakfast menu includes all kinds of omelets, and other egg dishes, including huevos rancheros and different kinds of eggs benedict. Sweet choices include four different kinds of French toast, including grand marnier and New Orleans (bourbon!) French toast and a few different kinds of pancakes, including granola banana hotcakes and chocolate chip. There are lots of choices for carnivores that include bacon and sausage gravy, so this might be a good place to go with mixed groups. 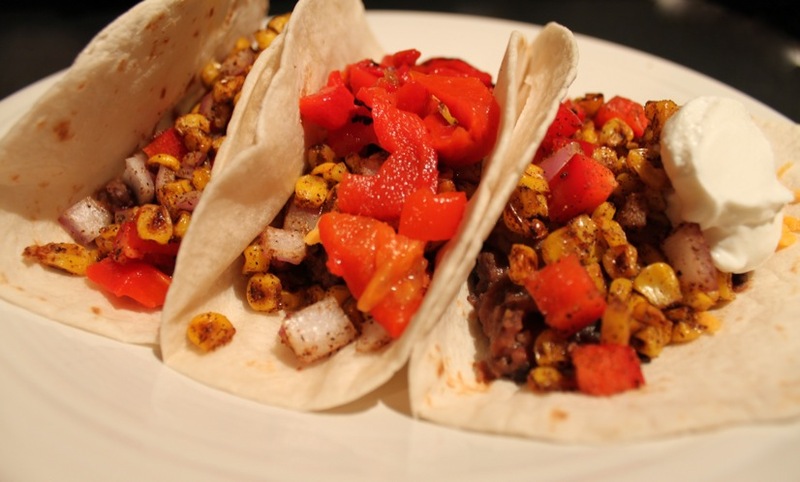 (But they also have veggie sausage, veggie burritos and the like). D gets one of two things when we’re out for breakfast — oatmeal or granola (he’s one of those people who actually uses his head and doesn’t eat something that will make him feel like crap and slip into a food coma even though it tastes so good). 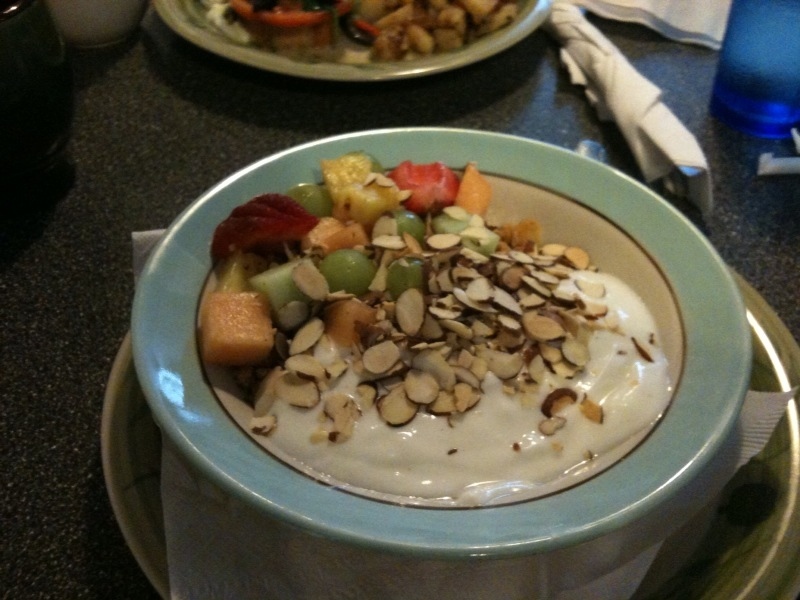 The Irish oatmeal sounded really good, but he went with the granola, fresh fruit and vanilla yogurt. It was gorgeous, topped with sliced almonds, melon and strawberries. I decided to go for the florentine benedict. 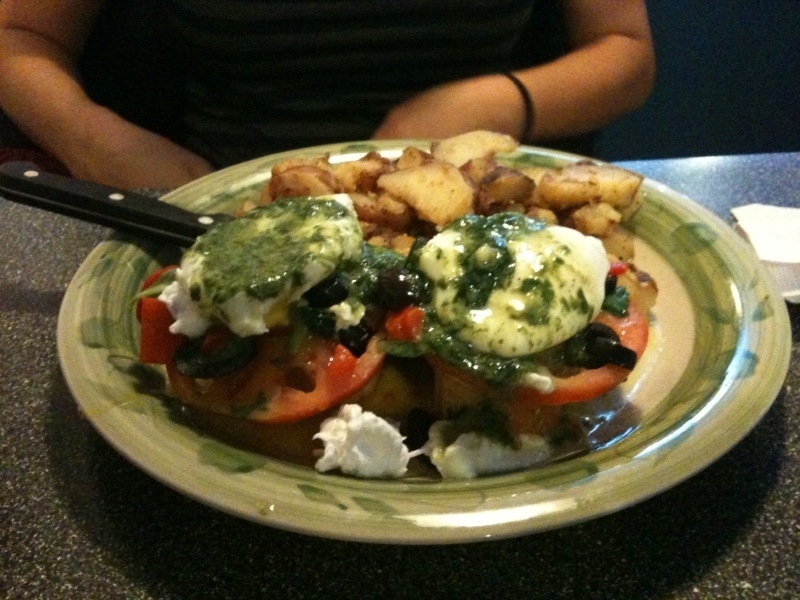 I have a problem with always wanting to order some form of benedict, which is difficult for a vegetarian. There’s regular (ham), salmon and all kinds of variations, but they all involve some kind of meat. When they don’t — I’m in! It came with home fries that I thought were spicy (but good) and D thought were bland, which doesn’t make sense, but there you have it. We left full but not feeling heavy, in about 45 minutes and for about $20 + tip. There are definitely some other things on the menu I’d like to try next time I’ll have to tap into their breakfast cocktail menu — they have bloody marys with dill vodka. DILL VODKA. And we definitely have to remember it when we have Claire in tow, as she’s a chocolate chip pancake connoisseur. Toast in Ferndale only is open for breakfast and lunch daily, with burgers, salads, sandwiches, quesadillas and roll-ups on the lunch menu. I think I got the veggie roll up last time, which has artichokes, avocado, mushrooms, zucchini, onions and more rolled in a tortilla. Maybe some day I’ll make it over to the new(ish) Toast in on Pierce Street in Birmingham, which includes a full bar, dinner menu, patio and is open until 2 a.m.
I’ve mentioned that I think I could eat curry just about every day and never get sick of it, and that’s still true. When I make it, I prefer to buy the already-cubed tofu, because I feel like it just stays together better in curries and stir fries. When that’s not available, I use your standard extra firm tofu… but I’ve always thought it wasn’t exactly FIRM. Like, by definition, it’s usually not really firm at all. And it’s supposed to be extra firm. I stopped by Holiday Market in Royal Oak Sunday and grabbed a kind of tofu I don’t remember seeing before: Rosewood. I didn’t think much of it or have very high hopes, but figured I might as well give it a shot. Eating some leftovers the next day, it was just the same firm tofu I’d added to the pot and hadn’t broken apart at all, like other “extra firm” tofu out there. I had never heard of the company, but it turns out Rosewood is right in Ann Arbor and makes a ton of soy and other natural products out there. 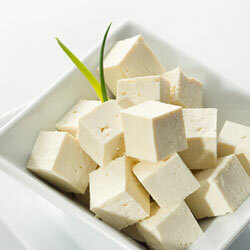 I’ll be keeping my eyes open and I’ll definitely be buying Rosewood firm tofu again (and again, and again)!